The first aspect readers may notice about Final Wicket is its weight. Its 480 pages on 275 First-Class cricketers who lost their lives is quite a feat by Nigel McCrery and is a highly commendable and valuable book on the subject. I have to admit to wondering whether a further book on cricketers who died in the Great War could have as much impact as the two excellent books, Wisden on the Great War and The Final Over, brought out last year a hundred years after the war begun. I am very happy to say that my thoughts proved completely unfounded and that Final Wicket complements the earlier-published books admirably. It is also nice to see the author of Wisden on the Great War, Andrew Renshaw, mentioned in the credits. Nigel McCrery is also no stranger to this type of subject having also written Into Touch – Rugby Internationals killed in the Great War. Both must have involved a vast amount of research as, in Final Wicket, each of the deceased is given a very thorough write-up with, in all but a few cases, an accompanying photograph. Naturally, photographs are not always still easily available and, in his Foreword, the author writes that he is very happy to be contacted should anyone be able to assist in this area. That said, he has done very well to obtain as many photographs as he has. Perhaps one of the book’s greatest assets is, where available, the plot reference of the grave is given. Sadly, many bodies were never recovered or identified but Nigel’s excellent research has ensured that mentions on memorials are also noted in the appreciations. Further commendable details mentioned are the players’ ranks, battalion/regiment, date of death, age and counties/clubs represented. Their First-Class details are also mentioned at the end of each profile but the book expertly combines both the fighting and cricketing careers of these valiant men. 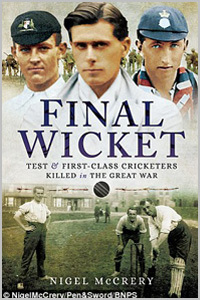 Other than the occasional typing mistake, Final Wicket is a most interesting and welcome addition to the subject of cricket and the Great War and Pen & Sword have produced a beautifully-crafted work. Just over one hundred years after war was declared in 1914, cricket literature has three rich, absorbing and, in their own ways, different books ensuring that those lives taken prematurely are not forgotten.